The nearest airport is Ndola. From Ndola, you travel to Chimfunshi via Kitwe and Chingola. The route is about 170 kilometres long. Due to poor road conditions, expect the journey to take about 3-4 hours. About a kilometre past the copper mines at Chingola is a police check point where you turn left onto Solwesi Road. On Solwesi Road, drive to Muschinshi and then another 10 minutes until you see on the left a first sign for Chimfunshi. After about another kilometre, turn right onto the dirt road near the second, large Chimfunshi sign. 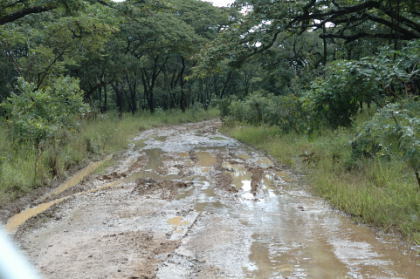 Now travel through the miombo woodland, a forest savannah, to Chimfunshi, about 40 minutes. As a rule, you should not drive in the dark as there are many deep potholes and the numerous lorries on the road make it very dangerous!